Western party. Western party ideas and decorating ideas. Western photo booth props. Large entrance and archway decorations. Cowboy party, cowgirl party, western wedding, rodeo party. 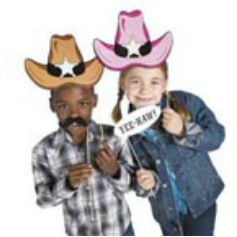 Find all you need for setting up a western party and photo booth for any event. This page is all about having parties and events with various western themes. Oh yes, there are sub themes. 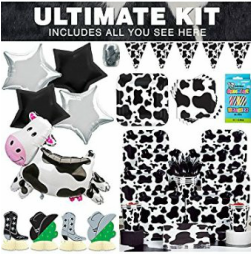 Here you will find some really fun ideas for anything from a western baby shower, classroom party, backyard rodeo or a wild west party with country line dancing. Many of these ideas along with others can also be used to decorate and host the best western themed wedding reception ever. Decorations and props can also be used for plays or other productions, booths and displays. I wouldn't leave you hanging with just the ideas, so you will find instructions, photos and videos from my personal experiences and others that can be useful in planning, organizing and hosting your party. This is a list of ideas that you can use to narrow down some themes used at a western party. The ones in red have a special page with more ideas for that type of party. For now, I will show you some ideas that will easily blend into any western themed party. Also see the related pages list at the bottom for more helpful party planning topics. 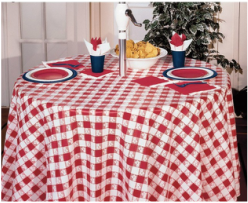 I will be showing you some photo backdrops a little way down the page, but I want to add here that I would not hesitate to use table covers for backdrops also. Hang them up alone or add some signs, cut outs or 3 dimensional items to make a fun setting for photos. 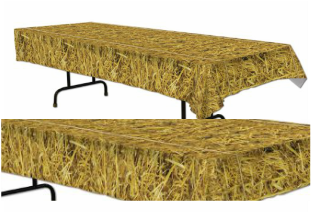 This table cover is printed to look like a bale of hay or straw. If you look at the listing and use the zoom feature, you will see that it looks very realistic. Both of these kits have all of the serving pieces for a party of 8 plus table cover, candles, balloons, pennant flags, banner, curling ribbon and a centerpiece set. These plates, cups and napkins are available separately. They say Wild West but I think they will be great for any type of western party, cowboy party or rodeo party. Balloons are an easy way to add a festive touch to your party. There are some western themed balloons that come individually or in sets. For a western dance party or a "kick off" party for any event, these cowboy boot balloons will be great decorations. This is a double sided balloon that any boot scooter would love to have at their birthday party. It is 26 inches high and 22 inches wide. There are a lot of ways to use these flags in your decorating. They can go along the wall, from wall to wall, to line fences or section off an area at a large event. The multi-colored flags can also be used outdoors. If you enjoy putting together your own decorations, here are some ideas that will help bring a western look to your party. These can be use on tables or in other areas that you want to decorate. Spruce up an area for a photo booth or use them as props. Dust off your cowboy boots and use them to make centerpieces for you serving tables or guest tables. Simply add some flowers or tie them with western ribbon or a bandanna. You can also use cowboy boot mugs. They are smaller that a regular boot, but you can do the same thing with them. These mugs are 6 1/2 inches tall and hold 17 ounces. There are 12 boots per set. If you are short on cowboy boots, you can still achieve a good look using mason jars or old vases you may already have. You could also use metal buckets as shown below with snacks or as a vase. A tin bucket will look good as is, with some flowers or add some bandana print, sunflower print or burlap ribbon around it. If you are working with a solid colored table cover provided by a banquet facility or even at home, you can add a sprinkle of confetti that will enhance the look of the table. Here are 2 different styles. I think the gold and silver horseshoes will look good for a western wedding reception, anniversary or even a western style New Years Eve party. The other is colorful with a variety of shapes and will brighten up the table for most any occasion. I took this picture at a livestock show. They had several different places where they used western style decorations. Some were large like this one with the wagon and some were smaller. The idea is the same though, bring together some bandana fabric, flowers, rope, wagon wheels or hay bales if you can get them. The same idea on a small scale can be used to make a centerpiece. 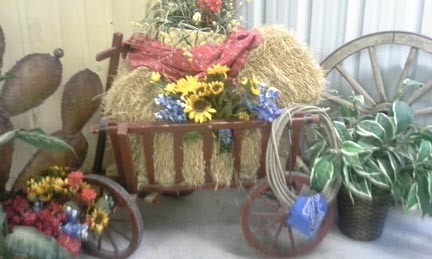 Use mini hay bales, just for rope, and bandana print ribbon. Along with the cowboy boot decorations, you can incorporate some cowboy hats also. As you see in the photo below from a party I was at, a mixture of boots with flowers and hats were used in the background setting they had for photos. For something like this, it is fine to use your own or borrow some cowboy hats since they will not be handled by people and get messed up. You can buy inexpensive cowboy party hats that will do just fine for adding to your decorations. You can also use them for serving bread or chips if you turn them upside down and lay a bandana or napkin inside of it. Hats are perfect for using in a photo booth as props also or get several and give them to your guest as party favors. Each straw cowboy hat has a red or blue plastic star and a chin cord. 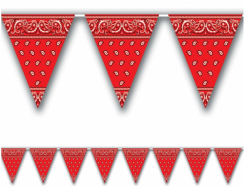 Bandanas and bandana print fabrics can be used in several ways to totally decorate or to accent other western party decorations. 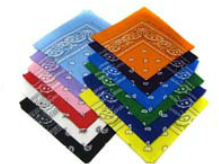 They come in a variety of colors so you are not limited to the standard red bandana. The light pink or light blue would be nice for a western themed baby shower or baby birthday party for example. Paisley Bandanas By The Dozen 100% Cotton 12-Pack 22" x 22"
Burlap, barbed wire, hay and rope are all common in western themes. Luckily these are readily available a crafting supplies so you won't have to run out to a barn looking for some. In long lengths, these can be used as garland, to make bows, intertwine into your floral arrangements or use for gift wrapping. Burlap bows are commonly used for western weddings. You can use the mini size hay bales as a foundation for a centerpiece or use them to hold table number cards. A fence rail can be assembled out of wood alone or use wood post and the faux barbed wire for an entrance or other area. Hang western style flags, banners or signs on it. I took these pictures at the grocery store where they had a western display built around the beer display. This is a good way to easily set up a booth for a BBQ cook off, Chili cook off or a western merchandise booth if you are setting up to sell items at a fair, stock show or rodeo. You can get inflatable and plastic props like this to use. 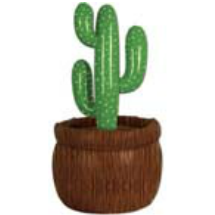 This inflatable cactus is also a cooler that can hold drinks and will sever a double purpose as decoration. This free standing 3 dimensional western split rail fence prop in made of cardboard and will need to be assembled. It is 3 feet 10 inches tall and 7 feet long. This is a set of 2 different cowboy figures. They are printed on both sides of board stock. Use them attached to a wall, fence or include them in a backdrop for photos. This is a cardboard stand up covered wagon prop. It is 4 feet 8 inches high and 5 feet 6 inches wide. Use western backdrops or scene setters anywhere you have room. They will look good on the wall behind your serving table or off to the side where guest can take photos. 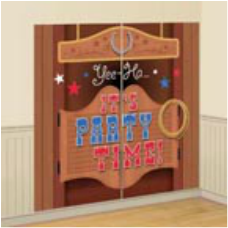 This barn door backdrop will look good for any western style party, farm party or barn dance theme. You could put a bale of hay in front of it to sit on or place a table nearby with other photo props. The reviews for this are good and there are some photos submitted by previous customers that you can see how the backdrops were used. 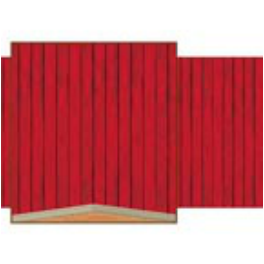 The red barn siding backdrop can look something like this when you add some cardboard cutouts to it. Yee - Ha .. Western Wall Scene Setter Decorating Kit (2 pcs.) Over 5 Feet Tall! Decorate a large area with a 10 x 10 backdrop. These come in a few different western themed designs. 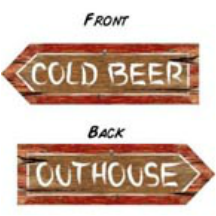 Get your guest headed in the right direction or just use signs for additional decorations. The set below on the left are like the ones uses with the red barn backdrop above. There are free standing archways with a western touch that you can use at an entrance or as part of your overall decorations. They really set the stage for what's to come and they also make a great backdrop for photos. 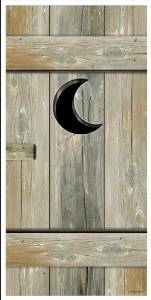 Use a cardboard archway like this one that is 10 feet high and 5 1/2 feet wide. It even has swinging doors with a 40 inch opening. Here is a larger set up with cowboy boots and balloons. It is printed on sturdy cardboard. The balloons are also included. If you are planning on having a dedicated area for taking photos, you may want to put up a sign directing your guest to where it is and they they are invited to pick up some props and take photos. 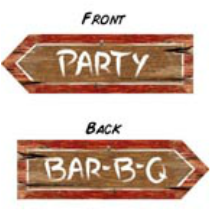 Don't forget some fun party props on a stick. Everyone just seems to love having these type of cutouts to hold while they are taking pictures. There are different assortments of these available online or make some yourself. This set has 12 different pieces that range from 7 to 13 inches mounted onto a 12 inch stick. 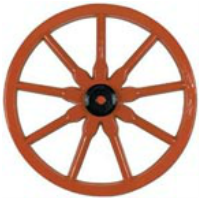 Click the picture to visit this page for other western photo booth props. ​An alternative to booths, backdrops and props is cardboard standups. Your guest will get a kick out of the restroom door covered to look like an outhouse. Just for fun, you could set a bucket of corn cobs outside the door. You should also check out the western costume page if you are planning a costume party or just want to dress up for the event. For additional entertainment, have Dolly Parton or John Wayne show up to the party. This is video from a very large western party. I thought you might like to see some of the ideas that I have shown put to use at a party. You may be planning a much smaller event, but the ideas are the same.